General Characteristics: Tall, erect, maturing within 9 to 12 months, producing from 5 to 10 oha; closely resembles Lauloa Palakea-eleele and Lauloa Palakea-ula but differentiated by the pink petiole base. Petiole: 100 to 140 cm. long, dark green heavily suffused with dark reddish-purple to blackish, especially on upper portion, purplish at apex, a brilliant pink ring at base, distinctly reddish-pink to almost whitish at edge. Leaf blade: 45 to 65 cm. long, 30 to 40 cm. wide, 35 to 50 cm. from tip to base of sinus, sagittate, slightly concave, dark green; margins with a few large undulations; piko purplish; veins purplish on lower surface of lobes; lobes obtuse with narrow sinus. Corm: Flesh white except for light pinkish tinge, especially near apex, the fibers yellowish; skin pink. Inflorescence: Peduncle yellowish, flecked with green and purple; spathe 20 to 24 cm. long, the lower tubular portion about 4 cm. long, light purplish, the upper portion medium yellow with reddish edge; spadix 8 to 10 cm. long, the sterile appendage 11 mm. long. Origin, and derivation of name: Native variety of comparatively recent origin, probably originating through somatic mutation; the derivation of the descriptive suffix is unknown. 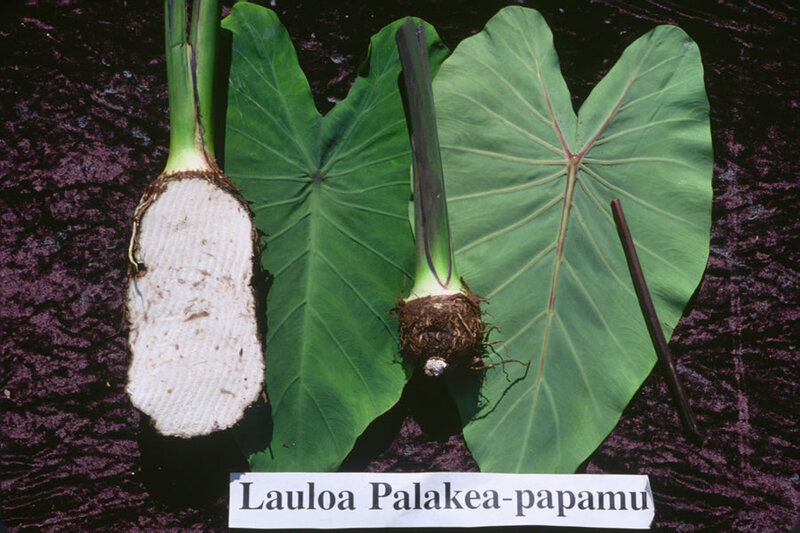 Distribution: Found only occasionally among the other forms of Lauloa Palakea.